Pancake, this tiny cakes are must for us especially for our sunday brunch. I love ginger flavor in bakes, though none at home love this flavor in bakes, obviously i think twice before adding ginger powder in my baked goodies. 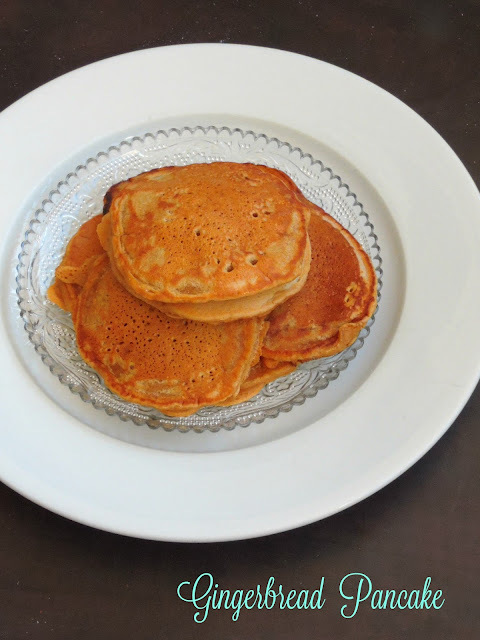 When i got ginger and curd as secret ingredients for this month's Shh cooking secretly event, i couldnt think much than dishing out some pancakes with some store bought gingerbread spices. Trust me, this pancakes with some honey will definitely fill some hungry tummies easily with less efforts. Last but not least, here comes an another excellent glass dessert to enjoy without any fuss. 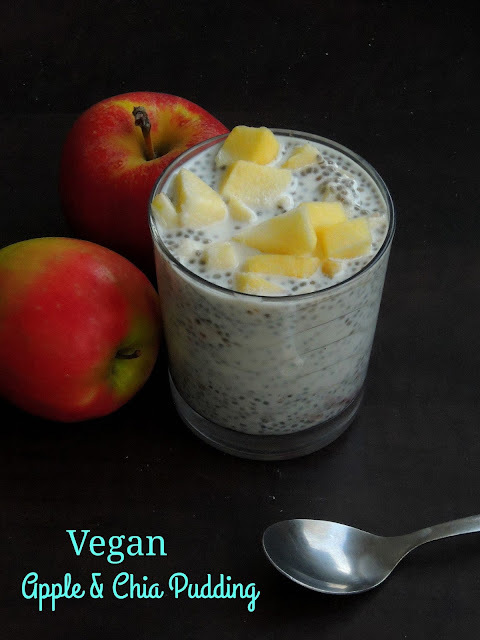 Chia seeds are very healthy and rich in protein, obviously if you are vegetarian and planning to take protein rich foods in your diet dont forget to include chia seeds. I have been looking for an opportunity to include this excellent super seeds in our diet since a while and tried my hands in making a simple rich looking pudding just with thick coconut milk, sugar with apple chunks. No cooking is needed hence this pudding is definitely a kid's friendly dessert to dish out with less efforts. Chia seeds are excellent for anyone, as they are very easy to digest if they are prepared properly. Not to forget that these seeds are seriously very versatile. Cheesecake calls for loads of eggs, cheese and for baking, though many incredible eggless version of cheesecake do exists which calls for no baking. My today's recipe is one among those no bake cheesecake served very much elegantly in a tall glass. Easy to whisk, this delicious eggfree cheesecake is like a child play. With less efforts, anyone can dish out this interesting glass dessert. As much as like usual cheesecake, a biscuit base is much needed for this dessert. Hence i opted for a simple biscuit crust which is later topped with a hung curd based less fat chocolate topping. 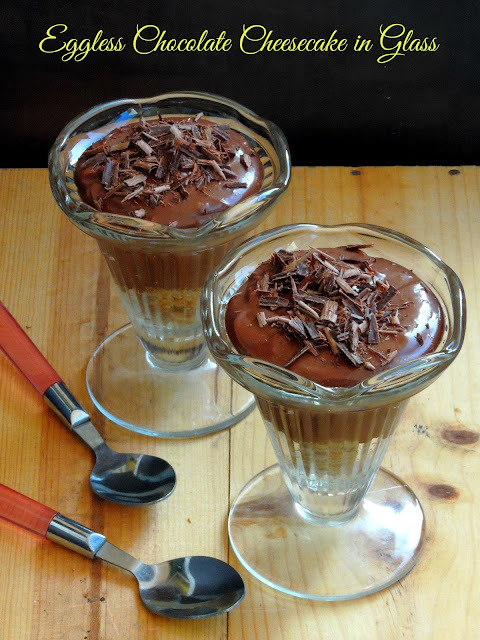 Whoever like to relish a delicious and chocolate loaded dessert will truly enjoy thoroughly this glass dessert. If you are searching for a delicious and very extremely easy dessert for an aftermeal, then you have to check this excellent yogurt parfait served along with strawberry coulis. Its not at all strawberry season here, but whenever i get sweet,succulent strawberries i dont forget to freeze them for later use. Obviously i had some delicious frozen strawberries in my freezer which i freezed while it was peak season for strawberries. Trust me this strawberries are quite handy to dish out some delicious coulis. 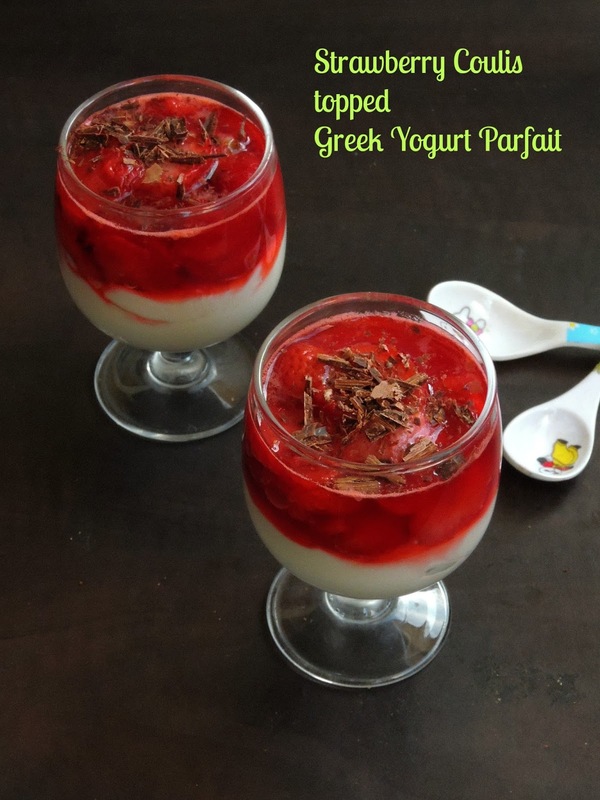 When i was planning for a very simple glass dessert, i couldnt resist to prepare this seriously very quick dessert which calls for some greek yogurt. Greek yogurt is high in protein, an excellent choice for low carb dieters. A greek yogurt can replace very well cream cheese, mayonnaise and butter in many dishes. Because of their thicker texture, these yogurts suits absolutely prefect to make some delicious simple desserts out of it. We are great fans of button mushroom, obviously this mushroom have their place in my fridge. Whenever i feel like eating something different, i dont forget to prepare different dishes out of mushroom and its been a while my younger one requested me to prepare some burger out of his favourite mushroom. When i picked Bring them on burger as theme for this week's blogging marathon's theme, i couldnt skip myself dishing out a super cheesy burger with mushroom. Easy to make, this burger will definitely please anyone's tastebuds.I felt personally its one of the easiest way to feed mushroom to everyone. If you would have went through my previous post, you mind have noticed that i have been running this week's blogging marathon with Bring them on burger as theme. I couldnt resist to prepare a meatless burger with some blanched spinach leaves and mashed leftover rice. Both works awesome and this patties came out extremely delicious and super healthy. 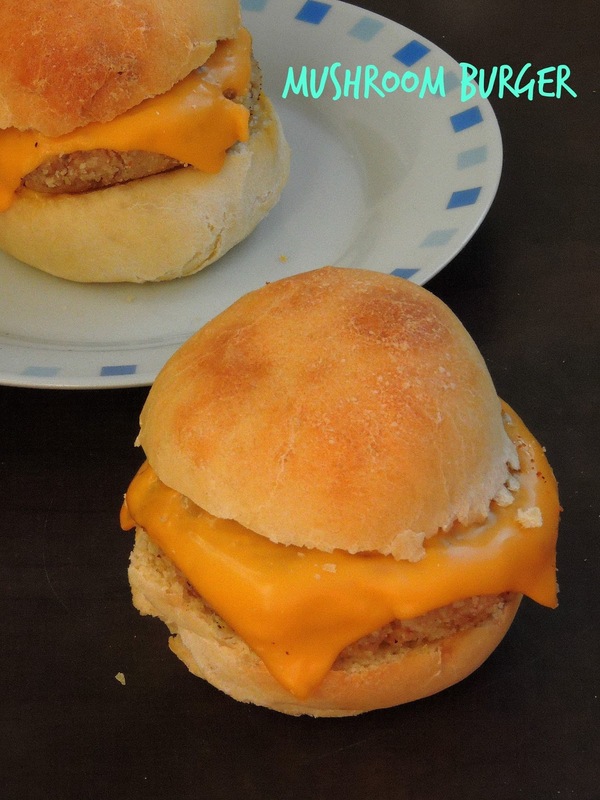 This gluten free patties are seriously very easy to make. Just blanched and chopped spinach leaves and nicely mashed rice spiced with garam masala powder, chopped green chillies and sauteed onions makes this fantastic patties, when served along with homemade burger buns trust me this meatless burger will definitely please everyone's hungry tummy. This week is going to be Burger, Burger, Burger. Yes i picked Bring them on burger as theme for this week's blogging marathon. Burger, this word itself makes everyone hungry at home. Obviously whenever i plan to make burger at home i dont hesitate a second to dish them from scratch. Yes from baking the burger buns to preparing the patties i do everything by myself to serve as burger to please my family's tastebuds. 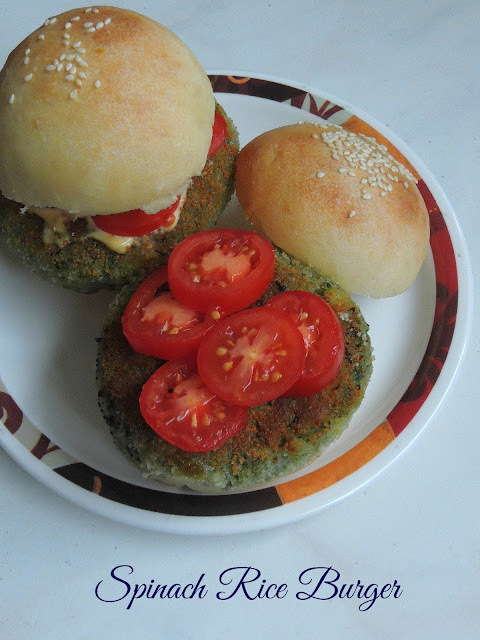 However meaty burgers are the most favourite for my younger one, but once a while he love to have some healthy vegetarian burgers as well. When i picked Bring the burger as theme, i immediately planned to prepare some mini burgers for our dinner to serve along with our bowl of soup. 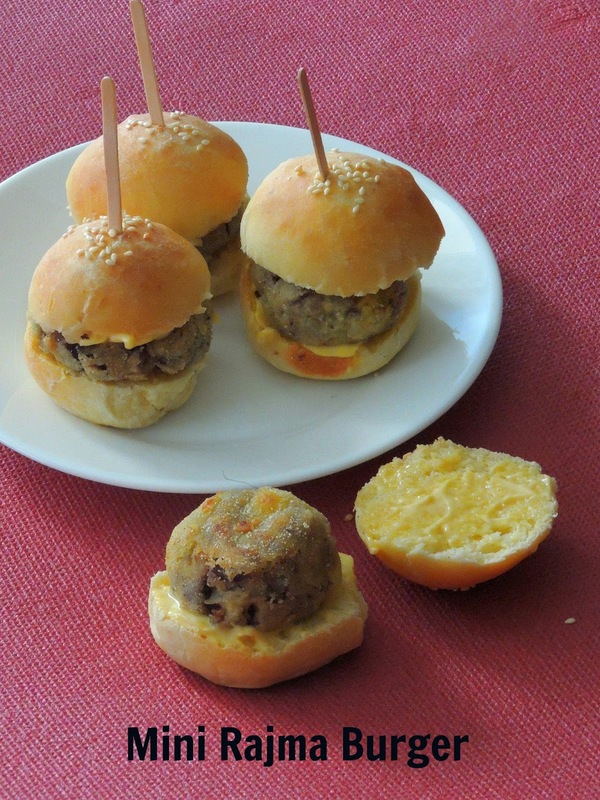 Trust me, we had a super filling dinner with this cute burgers and soup. 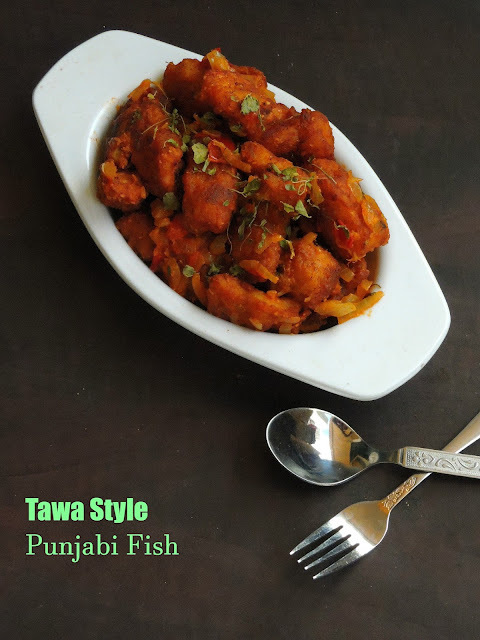 You might have noticed i have been posting Tawa friendly dishes for the past two days, today's recipe is definitely a delicious treat for Seafood lovers. Though am a great fan of fish fries, its been a long i prepared fish fries. However my today's recipe is quite a different dish from the usual fish fries. Amritsari style fried fish is an excellent starter when served for a get together or in a party. When i googled i saw varieties of Amritsari fried fish which calls for deep frying, but today's version goes for tawa frying. Tawa, this pan works awesome for frying fishes, hence i went with this tawa fried Amritsari fish. While watching a TV show, i got hooked to this delicious starter and i bookmarked this dish immediately. Finally i got a chance few days back to dish out this super delicious Punjabi style tawa fried fish for our Sunday lunch. Noodles, this word itself makes my kids happy, almost like pasta they just love noodles. Needless to say, my pantry will always have egg noodles as they are seriously very easy to dish out. As i told earlier, am in living in China town obviously noodles are very much cheaper than pastas, however i try to make atleast twice a month noodles to serve especially for dinner. Yes we dont eat noodles or any other breakfast dishes for our breakfast as i dont have enough time to make breakfast dishes. Most of our breakfast goes for cereals and bread toast, since they are easy and filling breakfast we dont hesitate a second to fill our tummy with them. Obviously breakfast dishes took a back seat and i make them often for our dinner to enjoy happily without hurry. Noodles are simple to make if you have all the ingredients in your pantry or in your fridge. 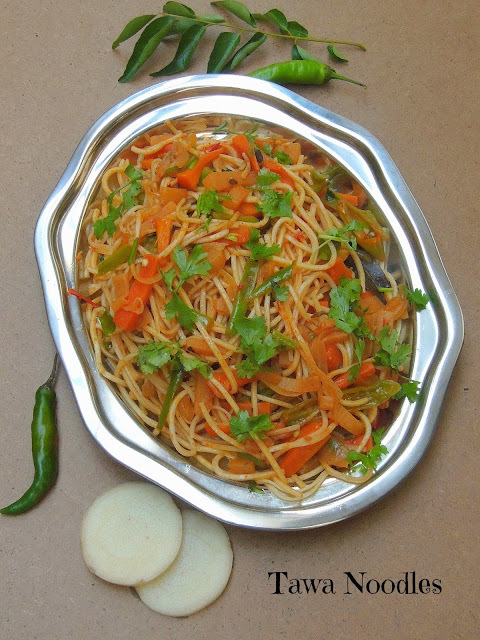 I have tried my hands in making a simple, though a delicious and super healthy tawa noodles recently using Banana stem aka Vazhaithandu, yes you read it rite. I love to include this banana stem in most of our dishes, though sometimes its really hard to feed everyone at home easily, hence i opted to feed this incredible stem this way by adding in their favourite noodles. This noodles was a big hit and none noticed the addition of the banana stem as they turned out crunchy after sauteeing. Everyone at home enjoyed this noodles happily with loads of vegetables as noodles are my kids favourite dish. Now i know how to feed them easily with healthy stuffs in their meal. 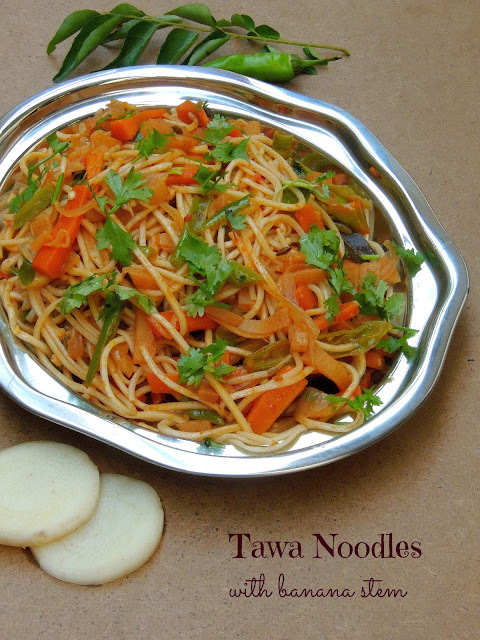 Am running this week's blogging marathon with 'Make in Tawa' as theme, hence am posting this tawa noodles which calls for quick and easy cooking process. Heat enough oil, fry the bay leaves and fennel seeds until they turns brown. Sauté the onions, slit opened green chillies until the onions turns transculent, add the ginger garlic paste, chopped tomatoes, cook until the tomatoes turns mushy. Add the veggies, sliced banana stem and sauté with enough salt until they get half cooked (dont over cook, veggies should be crunchy). Add immediately the garam masala powder and cook until everything get well mixed. Finally add the cooked noodles, toss everything well until the noodles gets well coated with the spices. Put off the stove, garnish with chopped coriander leaves. Tawa, this pan is a must in Indian cuisine, most of the Indian dishes are cooked in it, hence this utensil have their important place in every Indian's home. You may wonder why am talking about this pan, i have a reason for it and am running this week's blogging marathon with an interesting theme. My theme is Make in Tawa, obviously the three dishes for this week's marathon is going to be Tawa friendly dishes. For the first day of this week's theme, i couldnt resist to post a delicious and lunch box friendly rice dish with couple of vegetables. 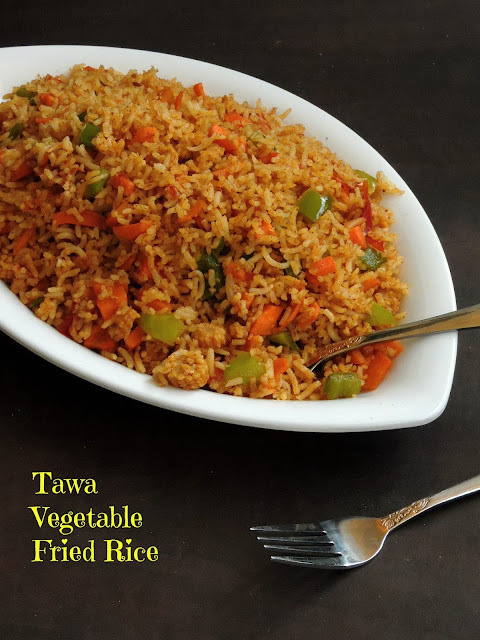 Very simple to make this tawa fried rice is definitely an easy breezy rice dish to give a try if you dont have enough time to cook an elaborate meal to pack in your kid's lunch box. If you have cooked rice in your fridge, then this rice gets ready very much quick than you imagine. 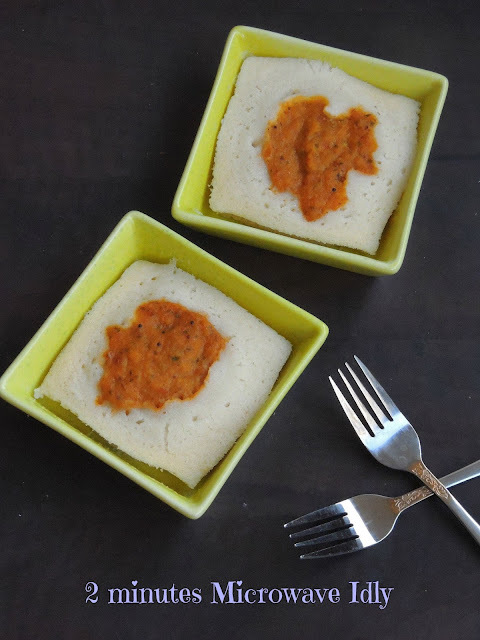 Idli, this savoury cake is every's South Indian's favourite especially for their breakfast, its quite a staple food for Tamilians. Been born and brought up in Tamil Nadu, i have been pampered with this healthy and nutritious gluten free savoury cakes almost everyday in our menu. Obviously i do prepare idlis often at home though the climate in Paris doesnt help much for the fermentation. However it never stopped us to prepare this gluten free cakes at home. 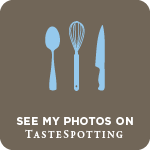 I have been posting different dishes since two days with idli batter in different ways. After a super filling sandwich and baked idli muffins, my today's post goes to aneasy breezy microwave cooking. 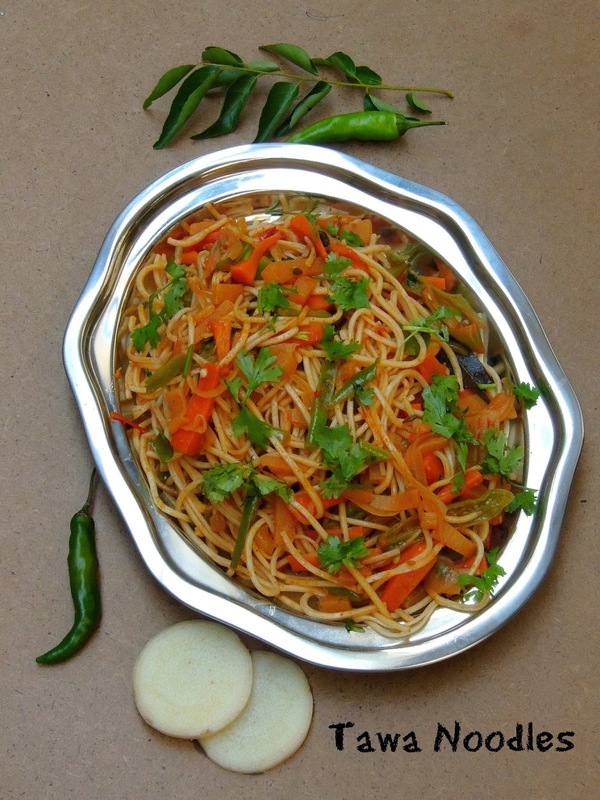 A prefect dish to make if you are living alone or bored to cook just for you as this dish calls for just 2 minutes to get ready. You may wonder while reading the name of my today's post, yes you read it rite, my today's recipe is a baked version of Idli. If you would have went through my earlier post, you might have noticed that am posting with a super interesting theme calls Pick a breakfast and do it in 3 different ways for this week's blogging marathon. After a lipsmacking sandwich, i want to dish out a different dish with Idli/dosa batter, hence i opted for a baking dish with the same usual idly batter. To make this idli muffins more interesting i opted for a lipsmacking and nutritious rajma masala. 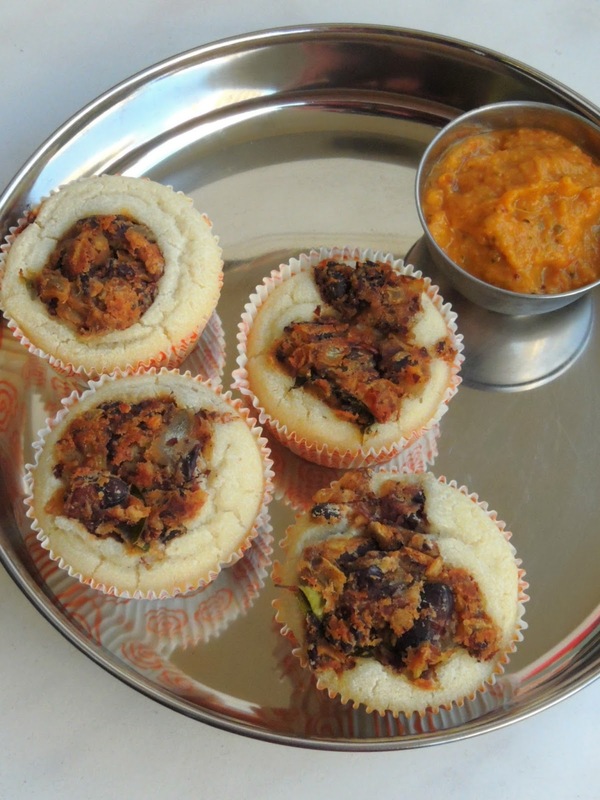 Adding rajma masala to this idli muffins makes this dish more delicious with more interesting nutritional values. Today its going to be Potato masala stuffed in a sandwich which is later coated with a simple onion loaded dosa batter, sounds interesting rite. Yes my today's post calls for a different breakfast dish prepared in a interesting way. Though Idli and dosas are all time favourite of South Indians, sometimes its quite interesting to dish out those usual idlies or dosas in a different way. I picked a tremendous theme for this week's blogging marathon 'Take one breakfast and make it in 3 different ways'.Obviously i picked idli/dosa batter to make dosa/idli in three different ways, obviously my today's post goes for an ultimate dosa sandwich stuffed with a simple potato masala. Trust me this sandwich is definitely a super filling one, you can pack them very well in anyone's lunch box. 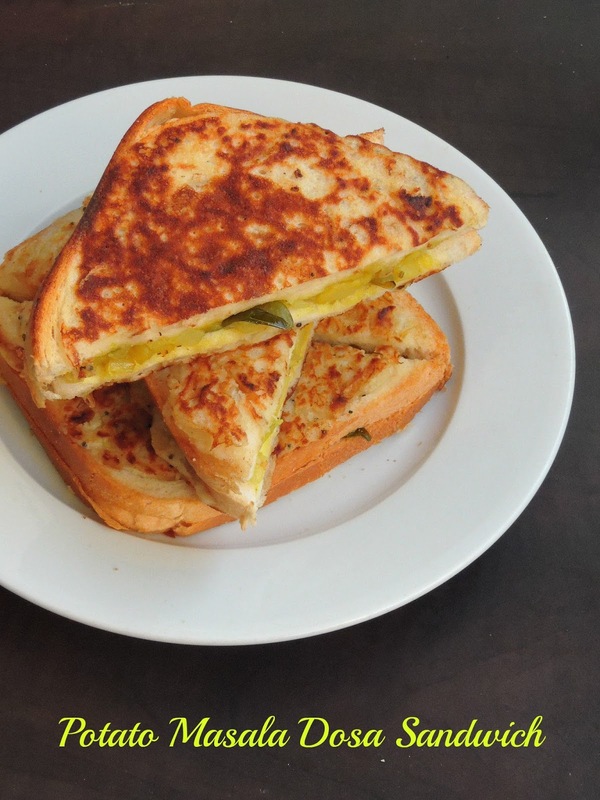 Yes this sandwich makes an excellent lunch or dinner.